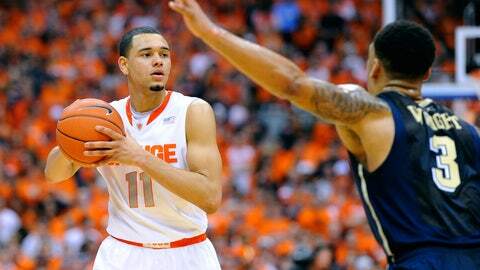 Led by freshman point guard Tyler Ennis, the Syracuse Orange are 18-0 and showing no signs of slowing down. Marcus Paige, North Carolina: After a rough few weeks, the Tar Heels’ sophomore point guard is mostly back to playing his natural spot as the primary ball-handler, and he posted 21 points (7-of-10 shooting) in 39 minutes against Boston College, adding four assists and two steals. He’s still having to play too many minutes, but it was a great sign that he was able to get to the basket and draw fouls rather than just shoot 3-pointers. Rasheed Sulaimon, Duke: When head coach Mike Krzyzewski started a new five-for-five substitution pattern, Sulaimon was the beneficiary as the sophomore got to go in as the centerpiece of a more offensively-challenged lineup. He responded by scoring 34 points in 41 minutes in two games this week on 11-of-20 shooting, adding eight assists to just one turnover. That’ll do nicely. Talib Zanna, Pittsburgh: While his teammate Lamar Patterson has gotten most of the attention this year, and deservedly so, Zanna has been excellent lately, averaging 17 points on 12-of-18 shooting and 10 rebounds in two games last week. He’s been almost as consistent as Patterson, though just not quite the stat-stuffer, and that’s high praise. Tyler Ennis/Jerami Grant, Syracuse: Ennis was clutch when it mattered most in both games this week for Syracuse, as the freshman point guard averaged 14 points on 9-of-19 shooting, four assists and 3.5 steals in 40 minutes per game. Yep, all 40. Grant, meanwhile, averaged 14 points (10-of-19 shooting) and six rebounds and has really emerged as a force down low. Joe Harris/Malcolm Brogdon, Virginia: Harris emerged from a slump (by his standards) this past week by averaging 16.5 points on 11-of-20 shooting to go with 5.5 rebounds in 33 minutes a game. But it’s been Brogdon that’s been the breakout player this year, especially lately, averaging 16.5 points last week on 11-of-26 shooting (but 10-of-10 at the foul line). He also averaged 4.5 rebounds, three assists and two steals a game. He reignited the Virginia offense in a comeback effort at Duke and followed it up with a very nice effort in a win over Florida State. Clemson: After beating Duke two weekends ago, Clemson could have fallen back to earth in a hurry. The Tigers didn’t play the toughest schedule last week — at Virginia Tech, home to Wake Forest — but they weathered some uglier offensive performances to tough out wins, and that’s all you can ask for in the ACC. At 13-4 (4-1 ACC), Clemson has already equaled last year’s win total and needs just two more league wins to pass last year’s ACC win total. And with four more wins overall, it would be the second-best season Brad Brownell has had since his arrival in 2011. Oh, and did I mention that Clemson is going to play at North Carolina this week, a place it hasn’t won since … snce ever? No. 2 Syracuse over No. 22 Pittsburgh, 59-54: It was a hard-fought game that looked more like a Big East matchup between the two former Big East rivals than it did an ACC game. (Although to be fair, considering how much scoring is down in the league this year, that might not be entirely accurate.) Pittsburgh proved that they’re here to stay and made nothing easy on Syracuse, and the Orange had to make plays late. Led by Ennis, they did just that. These two teams showed why they are the class of the league, and Syracuse showed why it’s maybe just a cut above everyone else. Yes, the Yellow Jackets are without one of their best players. But after a promising performance at home against Pitt, they fell on their collective faces against Miami, shooting a putrid 29.5 percent and scoring just 42 points at home against a team that the Jackets arguably should beat, even short-handed. Eddie won this award narrowly over Georgia Tech’s Chris Bolden, because while both of their team’s went 0-2 and both of them had awful weeks and Eddie has far less help around him than does Bolden, it was Eddie’s five turnovers that did him in. His final line this week was 2-of-11 shooting for five points, six rebounds, four assists, two steals, five fouls and five turnovers in 57 minutes. Bolden’s was more than comparable, though: 1-of-13 shooting for three points (and 1-of-11 from three), three rebounds, five assists, three steals, five fouls and no turnovers in 56 minutes.